The 164 is available with a 3.0L 6 cylinder 210 hp or a 6 cylinder 230 hp engine for 1994. ABS is standard and options include a 5 speed manual or 4 speed automatic transmission. Best car I've ever owned. I am a 164 fanatic. Owned two, 92 164L manual and 93 164L auto. Just a pleasure to drive, capable in many unmeasurable ways, pleasant in many ways people don't talk about (auto will downshift two gears at 60mph, visibility is great, ingress/egress can be elegant, very comfortable on long trips, hauls plenty, chrome intake runners, lighting is beautifully designed well before benz decided to do it on e-class). Styled well but doesn't shout. Quality materials where it counts (engine, seats, suspension). I have 166k mi now on the 93. Can still frighten BMW-5, Boxster, and Panamera drivers into behaving better. Feels light on its toes. Very stable at speed, better than anything I've driven (Porsche, Jag, Acura, Z, MBZs) except oddly, the Alfa Spider. Just traded a 380sl for work done on the Alfa 164. Lots of minor parts will break, and you won't care to pay to fix them. So it starts to become a 9 month, then a 6 month car. Electrics were designed for showroom gadgets, not easy maintenance. Door handles do break in the coldest part of Winter, and the door latch will seize. Not great mileage on the highway. Cruise control had unintended acceleration for me, before it died. But the basic drivetrain and seats will not let you down. I find the styling awkward from some angles (mainly because it is narrow enough to navigate Euro inner cities), though lovely from others. I thought the chrome heart was the nicest Alfa ever used (except perhaps the Stradale 33), but now all my chrome is body-color painted and it looks even better IMHO. Note that the 2-star rating in 2004 was for an Alfa 156, not 164. Heritage! Overall design and engine quality. The interior quality is awesome! The exterior quality is awesome! The engine engineering is awesome! Drive it like you stole it....AWESOME!!! AWESOME!!! I've always driven Italian cars and they are the best driving machines!!! You have to be a serious driver to understand and appreciate the Italian cars. Italian high performance cars are NOT meant to be driven like Japanese and American cars. Italian cars are build for super performance driving. If you love to drive...Italian cars. If you love to just cruise...get something else. 1978 Alfetta GT, 1988 Lotus Turbo. Everything you need for a passionate driver. Excellent feedback from steering, clutch and very quick acceleration response. Wonderful gear ratios and perfect weight distribution. 21st century comforts, styling and looks. Very good stability even at high speeds. Glitchy electricals, but thats not a problem if you have service manual disc and parts disc. You shouldnt mind getting your hands dirty, if not, just dont mind owning this car, this is not for you, but as I said earlier if you have big pocket, spend time finding a reliable mechanic who knows what he/she is doing. This is not a car you mess with. This is one of the best cars that I have owned. Once you get behind the steering, you gotta be thrilled and invigorating. You would never get bored and everyday will be as exciting as day one. Have to say working on this car is more fun than any other car and ofcourse you gotta be good with tools if you own one unless you have a big pocket. This car loves to drive fast and you cant drive slowly in this car (why?? drive it once to know). A true driver's car (period). Prompt maintainence is THE KEY. Engine noise, top-end power, comfort, looks, style. electrical glitches, mirrors door handles and alloys all susceptible to corrosion, hard ride. A great car. Not the most reliable, or comfortable, but it has a real character that gets under your skin. I looked around for a long time to get a really mint car, which had a blueprinted engine and gearbox rebuild, and i haven't been disappointed. Fun to drive, and quite relaxing if you're taking it easy, but drive it hard and it flies. A very fast car once it gets going. Sounds fantastic. This should be a stunning sports sedan if it were not let down in critical areas. Styling is superb. One of the first "retro" styles and still the best (personal taste). Handling and roadholding are excellent. Rebound in the front shocks under hard cornering can be fixed. Body roll is typical and can be sorted with a stiffer roll bar if desired. Braking is satisfactory. Body and interior are good after regular use. No rattles, squeaks or rust evident. Seats trim and upholstery in excellent order. Extras are minimal and the sound system is not great quality, but gadgets are not what one buys an Alfa for. Ride and comfort are firm but not harsh or noisy, and that's what you expect. Engine and road sounds are audible but not intrusive. Perfect for a sports sedan. Choice of tyres is critical to interior noise. High performance tyres and you can't hear yourself think. Now the down side. Performance below 3000 rpm (ie., city traffic) is awful. The car bogs down off the line so badly that it will not beat a clapped out Viva from the lights without a lot of engine revs and clutch slipping. Requires the same technique for any incline start and will not climb a 15 degree driveway from a standing start. A rolling start is essential. After the variable timing cuts over the rush is like an old-fashioned turbo. All this makes is a very uncomfortable car to drive in city traffic. My wife hates it. This issue seems to be an ECU / timing control problem, but the dealer has never been able to isolate or fix the problem. It is not an isolated instance. There is quite a lot of complaint about this issue on Alfa chat groups, with the same lack of resolution, although it does not seem to affect every vehicle. Second, the airconditioning is far below what is expected as a normal standard today. It is totally innefective on a warm (Australian) summer day. Most Australian, Japanese and European brands have sorted this issue long ago. Why not Alfa? Ergonomics is also below average. The main instruments are obscured by the steering wheel from a reasonably normal driving position, even though there is a lot of seat and steering wheel adjustment. On balance it did not deliver on the one important thing that you buy an Alfa Romeo for, a great driving experience. Alfa Romeo 164; Alfa GTV (1978); Alfa Guiletta (1975). Engine ..Sounds great and pulls like a true european sports sedan...Much better looking then the German and Japanese clone cars....Not dated even after 10 years..True quality car!Power everything. The 164 has to be the most under rated sedans ever made...I now have 126,000 miles on it,and have never had any engine work other then timing belts and tune ups...Very fine leather seats.Wonderful V6 engine second to none!This all alloy engine is as strong as a truck engine! Its starts in below zero weather on 1 crank ...If you change the plugs out and use only high octane fuel you should have no problems...The 1993 model has updated valve seals that last forever..Early models have more valve wear and may require a head rebuld after 100,000 miles. Heater valve,radiator,clutch will last around 100,000 if taken care of.The gearbox is a very smooth shifter...I had the springs,swap bars and shocks replaced at 100,000 miles(upgraded with stiff aftermarket parts).This is not a car to be affraid of..Buy it and enjoy...Remember it is now a older car,so be careful that the previous owner didnt abuse it...These cars can be driven very hard...Enjoy, if you can find a good one! Fine comfort and handling. High quality leather. Able to leap tall buildings in a single bound. Stunning styling at age ten. Auto shifts beautifully. Love those bun warmers! Replaced thermostat and belt tensioner. climate control erratic, will eventually get into this, not a great concern now. Bought it on a Tuesday, had it serviced Wednesday, drove it 700 miles Thursday! Performed stunningly, with silence at 100 mph. Half quart of oil used in 2000 miles. A dream come true. None. I own four Alfas, so I say, "Drive an Alfa and Live." A real driving pleasure probably without equal for the price paid. Gorgeous looks and styling from Pininfarina. A rare Italian head turner which is now becoming an "almost classic". Reliability; if you have regular servicing/preventative maintenance and don't take chances with cambelt changes then the 164 will really reward you. Practicality - it will seat 5 adults comfortably and has a cavernous boot/trunk and even a ski storage hatch. Very comfortable for long duration journeys - my car has the black leather recaro memory sports seats which are great. Very highly equipped with electric everything. The Alfa Romeo 3 litre 24 valve engine is one of the finest around and the note it produces under acceleration is great. I have heard people talk of the Cloverleaf as "one of the motoring world's best kept secrets" and I have to agree. The facelift models have far better headlamp brightness than the earlier 164's - I still have my original year 1991 164 Twin Spark 2-litre Lusso and her lights are not bright enough even with the front fog lights on. The information which is shared amongst the true alfistsi enthusiastic owners who love to share information worldwide with each other - most owners know that headlamp flashing almost always happens on those rare occasions that two 164's pass each other. The rarity and general lack of appreciation of these cars. High to very high servicing costs. Regular servicing is essential on 164's. Parts prices are high. Parts availability mostly good - but some items becoming scarce. Speedline alloy wheels look fabulous when new but do deteroriate and detract from the look of the car over time. Electrical problems and failures can occur from time to time but you can live with these easily enough since the car rewards highly in so many ways. Front tyre wear very heavy especially when pushing car to the limits. Wheel alignment/tracking checks on a regular basis recommended to keep tyre expenditure lower. Suspension wear - the bushes and trailing arms on 164's wear out over a fairly short time and some consider these "consumables". Sun roofs can leak if the drainage channels are not cleaned out periodically - I know from experience. Radiators are not robust and they need replacing fromn time to time. 164's use about 1 litre of oil every 1000 miles - ensure you check the level often! Air conditioning is not always wonderful even after servicing and re-gassing. Door handles very fragile - don't let the uneducated open the door themselves - open if for them. Front bonnets seem very prone to stone chips. I would advise not to let those who are not familiar with the 164 servicing anywhere near it to conduct any maintenance. Over time the paint - especially red colour and the upward facing surfaces - becomes faded which requires a re-spray to keep your pride and joy in mint condition. 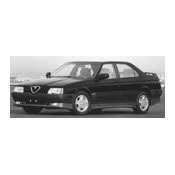 All Alfa Romeo 164's are real drivers cars and the Cloverleaf model is as good as they get - shame they are so hard to come by. They are becoming an all too rare sight and why the resale values in the UK are so low is a complete mystery. The 164 seems a big car but certainly doesn't feel big when driving, it handles superbly and sticks to the road like glue and the performance for a weight of 1530 kilogrammes is awesome. If you haven't owned or ever driven one; go out and treat yourself and buy one and see what you've been missing and I for one don't think you will be disappointed. Alfa Romeo 1991/J Twin Spark 2-Litre Lusso(1962cc 141,707 miles owned since June 1995 and still going strong/in daily use. "Cuore Sportivo". Performance is superb. The engine note is exquisite. A very pleasant vehicle to drive. Electrical system failures. This has included: electric drivers seat, air cond. display, right hand blinker, front passenger electric window switch, right front mirror and rear demister. Finding an experienced Alfa mechanic. Fuel consumption is high for a vehicle of its size and weight. This is my first Alfa. I use it as my daily drive car. It has 100,000kms on the clock, is a delight to drive and sounds just superb. It's a great looking vehicle and for a 10 year old vehicle, exceptional.